Two exhibitions in Seoul are offering a rare glimpse into the lives of different social classes in the Joseon era. 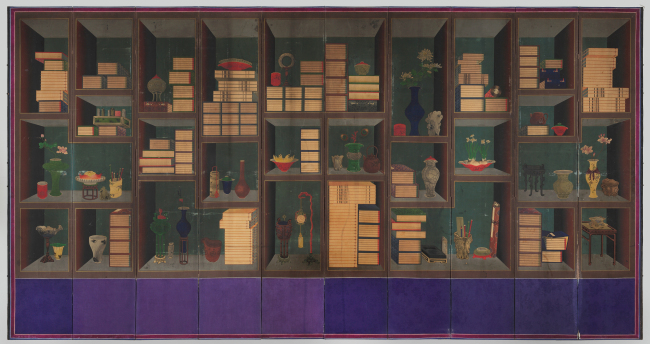 Seoul Arts Center’s Calligraphy Museum has brought together a rare collection of still life paintings from the Joseon era, depicting stacks of books with decorative luxury items, which were popular among royals and aristocrats. In contrast, the exhibition also features paintings of Chinese characters that wealthy commoners hung in their homes to emulate the upper class’ cultural tastes. Introduced from China, these still life paintings feature exotic and precious goods such as eye glasses, fruits such as watermelon and peach, luxurious furniture pieces, stationary items and ceramics that were imported from the Qing Dynasty China or European countries. “The isolated Joseon started to have trade exchanges with China in the latter part of 18th century. Aristocrats preferred to use tableware and furniture that were made in China. This lifestyle was criticized by the King Jeongjo,” wrote Chung Byung-mo, a professor of Gyeongju University, in an essay about the painting. Some of the most widely known masterpieces in the Kansong collection are on display, including the “Portrait of a Beauty” and “A Dano Day Scene” by painter Shin Yun-bok. Humor was an important part of genre paintings. 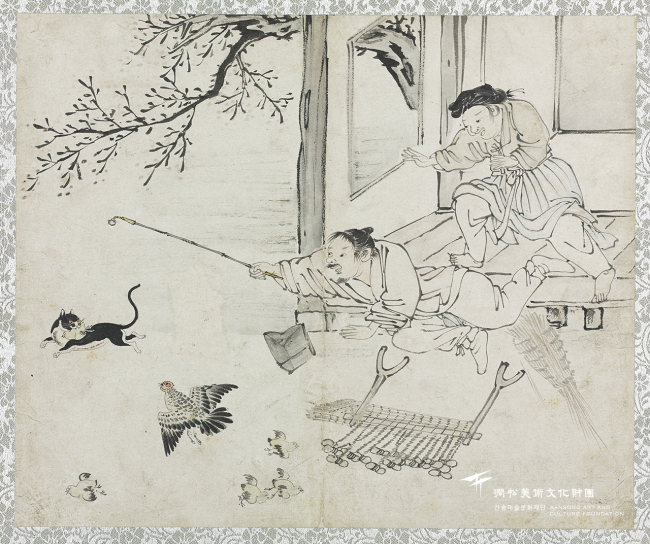 Painter Kim Deuk-sin captured a scene in which a cat snatching a chick startles the hen next to it, making it desperately chase the cat. The sudden hassle prompts the husband and wife working inside the house to stop their work and rush out to catch the cat.